HMH Books for Young Readers, 9780544949874, 96pp. Beavers, the first book in the new middle-grade nonfiction Superhero Field Guide series by Rachel Poliquin and award-winning illustrator Nicholas John Frith, is a delightfully informative, laugh-out-loud full-color look at the most unsuspecting of animal heroes, perfect for readers who like their facts served with a large dose of humor. Meet Elmer, an ordinary beaver. He may not be as mighty as a lion or as dangerous as a shark. He may be squat and brown. But never underestimate a beaver. Yes, they are! And believe it or not, those buck teeth and funny flat tails are just a few of the things that make beavers extraordinary. 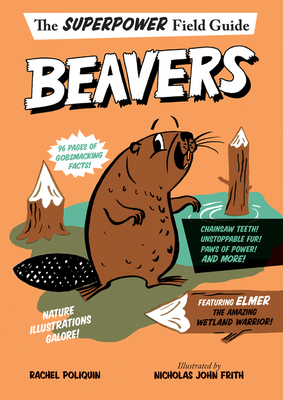 Humorous and engaging, Beavers is the first book in the new highly illustrated nonfiction Superpower Field Guide series, inspiring readers to laugh, think, and view the world around them with new eyes. Rachel Poliquin is a writer engaged in all things orderly and disorderly in the natural world. With a cross-disciplinary background in visual arts, cultural history and natural history, she holds a Ph.D. in Comparative Literature from the University of British Columbia and a Post-Doctoral Degree in History from the Massachusetts Institute of Technology. Poliquin is the author of the Superpower Field Guide series, and has also written for Science Friday, The Believer Magazine, and The New York Times. Nicholas John Frith is the author/illustrator of Hector and Hummingbird, shortlisted for the Waterstones Children's book Prize 2016 and winner of the inaugural Klaus Flugge Prize, as well as the book Hello, Mr. Dodo! and the Superpower Field Guide series. He lives and works on the coast of Dorset, England.